Since there is nothing that crosses the chasm between local and online like mobile, this Open Product Design is for you Blockbuster Mobile Product Manager. Sit back, open your composition notebook, grab a cup of coffee, and listen to the ramblings of a fellow Product Manager who has watched 243 movies using Blockbuster Online. I’m in your stores all the time to exchange my online rentals for a new arrival or a very long wait movie in my queue, and I often find several movies that I can’t decide between. Either I have to remember to add them to my queue when I get home, or I have to dig out my iPhone, fiddle through search or browse to try and find them. Instead of all that, join the RedLaser age and let me scan the UPC on the back of the movie, and interact in a more meaningful way. See details – Once I scan the barcode, show brief details of the movie: image, title, rating, genre, star rating and in store availability at my preferred store. Tap to view full details including synopsis, Directors, Actors as you do today. Add to queue – You already know that I prefer Blu-Ray so simplify the interaction to a single click to add to my queue. View trailer – The boxes on the shelf only have so much to offer. Online you have cool trailers you can show me. Wait a minute, this iPhone can play video. Wink. Wink. Favorite Store – Online you have my favorite stores, on my phone you keep asking me for my zip code. Why? Make that a setting you pull from my online account. The application doesn’t stop working when I walk through the exit door of my local Blockbuster store, I can scan stuff at BestBuy, Wal-Mart and Target too. I’m not going to buy movies anymore — sorry movie companies — but I am still strangely attracted to the movie section like a moth to a bug zapper from time to time. Here are my quick hits for small tweaks to the service. Or big ones, but I was just to lazy to create additional Balsamiqs for them. 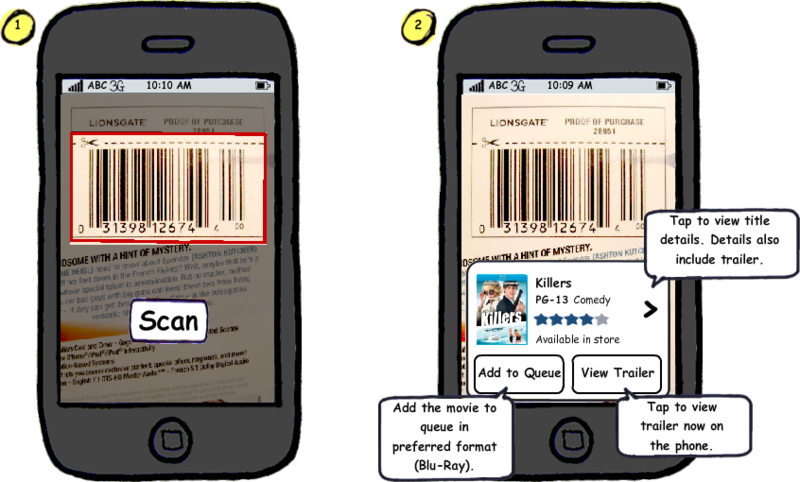 Store availability – Show my favorite store’s availability for every movie in every flow. I can hear you grumbling all the way from Chicago as you are reading this – “But Streeter… That will require a look up in the database for every movie. My developers are going to kill me if I ask for that.” Get over it, it’s much more useful than an available locally designation. Load them asynchronously like you do the images. Browse – Add to top of queue from the [get it] button. Please. It saves me a step of switching to the queue, then scrolling to the bottom and clicking move to top. Queue – Report an issue for the movies I have using the mobile app. Doesn’t happen frequently, but it is a pain to go online and find the report issue section. Browse – I am a hoarder. I have hundreds of movies in my queue. It is a pain if I want to find a comedy to add to move to the top of my queue, or to view local availability. Let me browse my queue the same as I can browse the full catalog on the application already. Browse – Let me dismiss the New Releases ad. It takes up too much screen space. At least make it go away over time. Browse – Now I’m down to nit picking. Don’t show me movies that I already have at home. It doesn’t make sense. I get it, it’s expensive to calculate for each person and creates lots of corner cases on what to show instead. But it’s annoying.